Features:This wig is based on the character Chiaki Nanami of the cartoon Dangan-Ronpa 2 .This cheap but high quality taro wig is pretty ,the straight hair looks well. It is not thick one,so it will fit you well. The texture is very soft, very shiny. 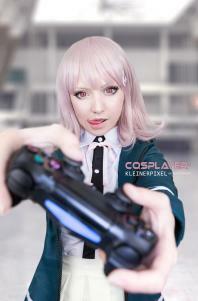 Moreover, with this wig, you will be closer to the role Chiaki Nanami.